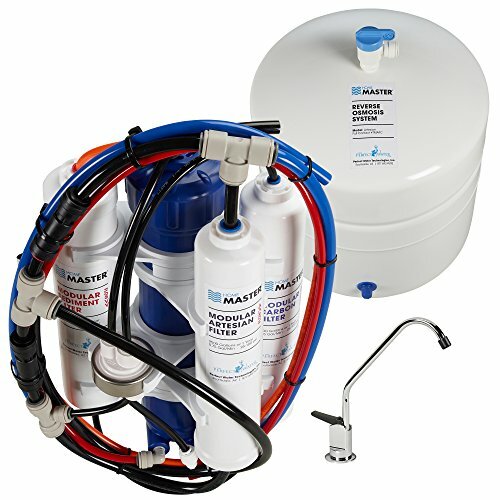 Home Master Artesian Full Contact Reverse Osmosis System solves many of the problems associated with traditional RO systems. Home Master RO systems use larger fittings and tubing than Traditional RO systems to double the flow rate. Traditional RO systems produce demineralized water that is highly pure but slightly acidic. This acidic water attacks the rubber bladder in the storage tank, entering the water stream and affecting the taste. The patented Home Master Artesian Full Contact remineralizes the water twice. Our patented remineralization system pH balances the water once on the way to the storage tank, and once again on the way to the faucet adding a small amount of calcium and magnesium minerals (30-60 mg/l), just enough to make the water slightly alkaline and improve the taste. The Home Master Artesian Full Contact delivers Mineral Water on Tap by first stripping the water clean, removing up to 98-percent of chlorine, chemicals, heavy metals, dissolved solids, pharmaceuticals and other contaminants using reverse osmosis, sediment and carbon filtration, then channels the water through the patented remineralization system twice to add calcium and magnesium minerals from a fresh new source. With 7 stages of filtration, purification and enhancement The Home Master Artesian Full Contact produces exceptionally pure, Mineral Water on Tap. In designing the Home Master RO a sophisticated combination of flow restriction components were integrated into the system architecture to regulate pressure in the 50 gpd membrane chamber for optimized purification and minimized wastewater production. The most sophisticated components certified to NSF standards are included in the design and construction of our product. In the Box: Fully assembled purification unit, storage tank, 1 year of filters, 3/8-Inch feed water adapter with shut off, chrome faucet, faucet adapter, tfc RO membrane, drain saddle and instructions. 5 year limited warranty. A better RO System - innovative design solves most common problems associated with traditional RO systems. Highly Pure Water - its seven stages of filtration and enhancement remove up to 98 percent of chemicals, including chloramine, and other contaminants. Added minerals for great taste - patented Full Contact technology adds calcium and magnesium minerals twice during the purification process. Long lasting and easy change filters - change only once a year or every 2000 gallons; no wrenches required. Faster flow rate - water flows twice as fast compared to traditional RO systems. Made in USA. If you have any questions about this product by Home Master, contact us by completing and submitting the form below. If you are looking for a specif part number, please include it with your message.